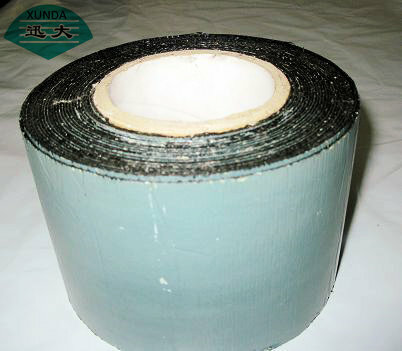 XUNDA Cold-applied Polypropylene Fortifying Fiber Anticorrosion Tape is a new-type environmental protection anticorrosion product, which is free from pollution or other damage. Crowned with the title "championship in anticorrosion", it represents the highest level of cold-applied anticorrosion tapes at home and abroad. It can be used for the purpose of steel pipe and underground steel tank surface corrosion resistance and rehabilitation for various pipelines in facility projects of petroleum, petrochemical industry, city gas, oil and gas storage and transportation, power, water supply etc. Therefore, it has been recommended by National Construction Department, Environmental Protection Bureau to take place of "pitch glass fabric" and "epoxy coal pitch". Easy and convenient in application it performs well in shock resistance, aging resistance, stretching resistance, UV resistance, and adhesive strength. The backing material of the product is modified PP woven fabric cloth, and the anticorrosion layer of it is butyl rubber modified asphalt. Since its backing material is of fabric structure it can resist effectively the creep caused by soil stress. In addition, the ageing test proves that its service life is beyond 50 years and all the indexes of the items surpass the standard prescribed in SY/T0414_98 and reach that of ANSI/AWWAC209-00 and NACEMR0274-95. It is the best choice for cold anticorrosion project and also the most economical one.